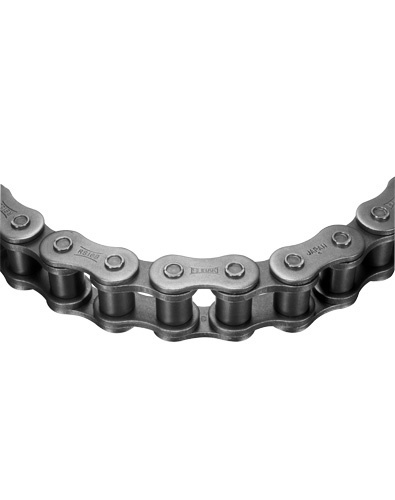 British Standard Chain is commonly found on machinery that was originally manufactured outside of North America or made in North America and destined for export. Tsubaki British Standard chain conforms to all recognized standard associations (ISO 606, BS 228, and DIN 8187). Available in sizes from 05B to 56B the reliability of nearly a century of chain manufacturing excellence goes into every link. Sizes 16B to 24B features Tsubaki's unique G7 solid bushing design complete with patented lube grooves, a feature that provides unsurpassed wearability ensuring your critical applications are kept running. Easy cutting on sizes RS08B – RS16B, ring coined conn links, solid rollers and bushings, center sink design rivet head, wider link plate design and all chain is factory pre-stressed.